In 1985, While waiting in a saloon on a Sunday morning, Mr S B Jagadeeswaran of Coimbatore (now aged 58) was scanning the newspapers. He was reading about some of the Guinness record achievers. In the same page, he also read the story on the plight of blind people. That triggered a spark in his mind and he realised the purpose of his life. At He decided to help the blind people restore the vision and contribute something for the benefit of the society. From that day onwards, he started campaigning for ‘eye donation’. Whenever he gets the information about the death of any person within 60 KM radius of Coimbatore, he rushes to the place immediately. 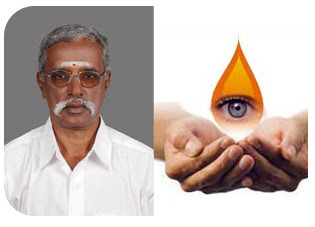 He talks to the important people in the family about the importance of ‘eye donation’. In most of the cases, he convinces them and takes the permission to remove the eyes of the deceased person. Till date, he has managed to get 523 pairs of eyes from the deceased persons. Because of this, 1046 blind persons have got the vision free of cost. It is not that every time, he gets the support of the family members of the deceased person. He was also beaten up by some of the villagers and had to be hospitalized. On an average, he gets around 3 pairs of eyes every month. He works as an ‘agent’ for a transport company. With his meagre income, he also spends around Rs.750/- to Rs.1000/- every time, he visits the places whenever he hears about the death of any person. Though all the service clubs honour him, nobody supports him financially. Besides campaigning for eye donation, he also campaigns for ‘blood donation’. So far, he has secured nearly 5000 units of blood. He himself has donated blood 67 times. His wife has also donated 30 times. He loves the great leaders of India. He has named one of his sons ‘Subash Chandra Bose’ and next son ‘Vivekananda’.